Dozens of teachers, parents, students and community members crowded into the McCallum cafeteria on Nov. 7 to discuss education finance with volunteer committee members — not traditionally the biggest draw. However, this group’s mission is more urgent than boring: saving the Austin Independent School District (AISD) from bankruptcy. In the quest to make up a multi-million dollar deficit, the committee floated ideas including completely cutting magnet programs, eliminating special magnet transportation, instituting a pay-to-ride system for magnet transportation, and reforming the magnet staffing allocation. The Budget Stabilization Task Force (BSTF) was created over the summer of 2018, and tasked with providing recommendations for balancing the budget and making up for a $30 million deficit. 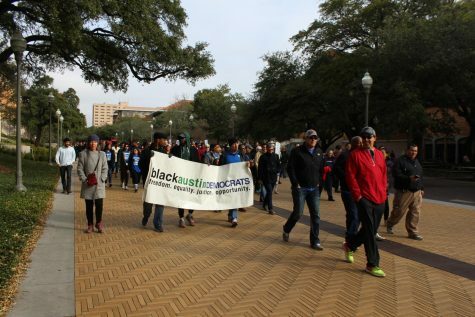 After requesting several extensions, the group hopes to give recommendations to the Board of Trustees in 2019, said Claire Milam, tri-chair of the BSTF. Although the district receives over a billion dollars annually in taxes, as a property-rich district it sends nearly half of its revenue to the state per the “Robin Hood” recapture law. The money the district sends to the state is then redistributed to property-poor school districts without the ability to collect enough tax money to cover their expenses. LASA Principal Stacia Crescenzi said there is a lack of awareness in the student body about recapture, one of the main reasons AISD faces the shortfall it does. The Robin Hood system, which has been criticized for accounting poorly for the different costs of educating underprivileged students, draws increasing amounts of money from AISD as Austin property values rise. Although the district is planning to advocate reforms at the next legislative session, for now they have to work within a system of austerity. LASA Campus Advisory Council (CAC) co-chair Ann Phipps said real cuts would have to be made to achieve balance. Although the committee’s primary goal is cost saving, Milam said not all of the big-dollar possible cuts would be effective policy. One idea, touted as a source of multimillion-dollar savings, proposed teachers instructing one more block each, or seven of eight blocks. It was met with vehement opposition in public comment and did not make it out of the staffing subcommittee. The recommendations the committee eventually makes will receive community input and then pass to the superintendent. Although the process has gone on longer than originally planned, to avoid bankruptcy the district will need to make significant cuts starting in the next school year. The BSTF looked closely at magnet and specialty programs in their search for possible cuts, with one sub-committee proposing eliminating magnets, magnet busing, and the extra magnet staff allocation. Milam said ideally, all recommendations would be phased in long term. If approved by the BSTF, the recommendations would not be immediately enacted. They pass over to Superintendent Paul Cruz, who can examine them and decide which to propose to the board. Crescenzi said that any recommendation to close down or reduce size of the magnets would likely lead to a decrease in overall AISD enrollment, therefore further lowering funding and exacerbating budget issues. Milam said that the magnet transport was a more likely spot for cuts to be made. The three magnet programs with guaranteed transportation — LASA, Fulmore, and Kealing — spend millions on busing annually. However, LASA CAC co-Chair Melanie Plowman said the transport was worth the cost, especially given the school’s goals for student body diversity. Just ten percent of LASA students are economically disadvantaged (low SES), a low ratio in a district where over half of students are low SES. The school has worked to increase its economic diversity, including by weighting economic status in the admissions process, and Plowman said restrictions on transport could further stratify access. Milam said there were more conversations to be had about the nuances of the plans before they were improved by the committee. The final possible recommendation, adjusting staffing allocation, should be considered as a part of a larger overhaul of magnet staffing funding procedures , Crescenzi said. Currently, magnet schools receive an extra 25 to 30 percent staffing allocation, including funding for signature course teachers. However, LASA does not receive certain administration members that non-magnet schools do. LASA currently trades some extra allocation spots to hire counselors and assistant principals, among others. However, with a $30 million deficit, Crescenzi said all schools will have to make cuts — including LASA. In FY2018, the school’s budget was $4,814 per student, one of the lowest among district high schools. When making cuts, Plowman said it was important to try and preserve the integrity of programs and avoid directly affecting students. The BSTF has emphasized the importance of an equity lens when looking at programmatic cuts. Back at the meeting, the staffing subcommittee presented to the BSTF and packed cafeteria. Clicking through powerpoint slides on staffing possibilities, BSTF member Mike Cranor commented on the district’s spending.